The Department of Physics and Astronomy is headquartered in Frederick Reines Hall (FRH). The Department also maintains offices, labs, and instructional facilities in Rowland Hall (RH), MSTB, Natural Sciences 1, and Natural Sciences 2. On the close-up map below, these buildings are highlighted in yellow. Click here for Google Maps directions to FRH. You can find campus maps here. 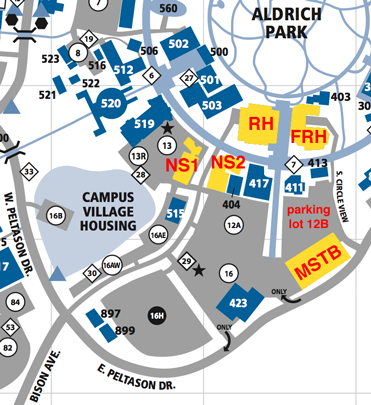 On the Main Campus Core map, FRH is Building 401, located south of Aldrich Park. Physics Administration is located on the fourth floor of FRH. The reception area is in room 4129, and is generally open Monday through Friday, 8 a.m. to noon and 1 p.m. to 5 p.m. Contact information for the main office is given on the Contact Physics page. UC Irvine is located close to the 73, 405, 55, and 5 freeways. 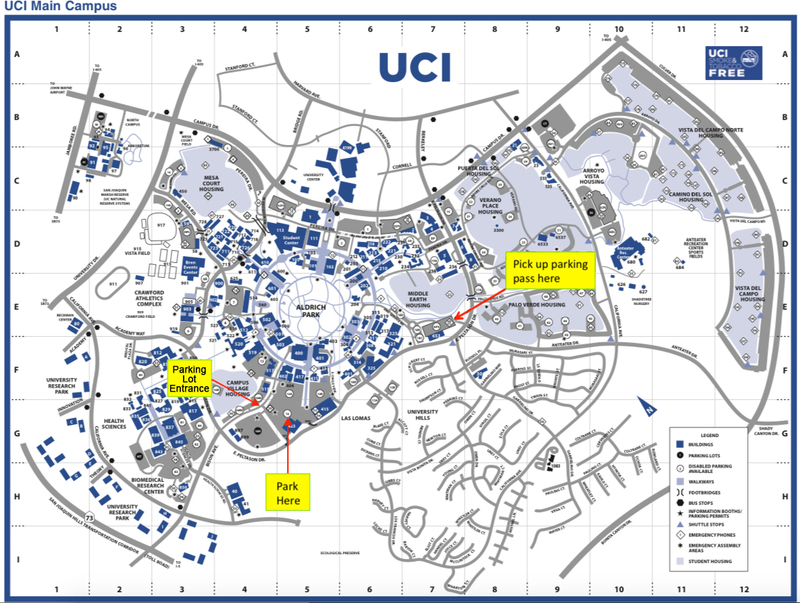 The Visit UCI site has driving directions to the campus from each of these freeways. The nearest parking lot is Lot 16. The main entrance to Lot 16 is on Bison Avenue, and there is another entrance from the westbound side of E. Peltason Drive. Click here for Google Maps directions to Lot 16. Visitors should be aware that Lot 12B is closed for construction as of Summer 2018. Parking permits are required and may be purchased from a Parking Transaction Kiosk. Staffed kiosks are located at the main UCI parking structures, but not at lot 16. If you are parking in Lot 16, there is a permit dispensing machine that accepts credit cards near the lot entrance. If a parking permit has been reserved for you by the Department of Physics, please retrieve your permit at the Anteater Parking Structure on East Peltason, between Campus Drive and Anteater Drive (click here for the location of APS on Google Maps). Once you have the permit, you can drive back along East Peltason Drive to Lot 16 to park. As you're driving westbound on E. Peltason Drive from the Anteater Parking Structure, continue past Los Trancos Drive and S. Circle View, and shortly after that you'll see a driveway entrance into Lot 16 on your right. If you miss that entrance, keep going and make a right on Bison, and then follow Bison to the main entrance to Lot 16. Click on the map below to download a pdf map pointing out the locations of the Anteater Parking Structure and Lot 16. Visitors with a valid permit may park in any unmarked space. A visitor from another UC campus may use their campus permit through campus parking reciprocity to park in an unmarked stall. Parking permits from other UC campuses are not valid in "AR" or "Reserved" spaces. The UCI campus is approximately 4 miles from the Orange County's John Wayne Airport (SNA). A taxi from the Orange County Airport will cost approximately $15. Please direct the driver to Parking Lot 16, which can be accessed from Bison Ave.
UCI is 43 miles from Los Angeles International Airport (LAX), and 24 miles from Long Beach Airport (LGB). The Orange County Transportation Authority runs bus lines that stop at the Campus-University Center bus stop on the north side of the UCI campus along Campus Drive, about a 10 minute walk from Frederick Reines Hall. To plan a trip, consult the Google Maps transit planner. Our closest rail stations are Irvine Station, served by Amtrak and Metrolink, and Tustin Station, served by Metrolink. These stations are located several miles from the UCI campus. The most convenient transport options between the rail stations and the UCI campus are taxis or ride-share services. The OCTA offers a very limited bus service between UCI and Tustin Station: consult the OCTA Bus Overview page or the Google transit planner for current schedules for Route 473 between Tustin Metrolink and UC Irvine. There are numerous hotels near UCI and close to John Wayne Airport, although none are within walking distance. Some of the local hotels have a morning shuttle service that can take visitors to UCI. The Visit UCI site has a list of nearby hotels that offer a special UCI rate. Convenient choices from this list that are close to UCI and the airport include the Atrium Hotel and the Ayres Hotel. In most cases, to obtain the UCI rate you will need to make your reservation by phone to request the special rate. If you make your reservation through an online travel site such as Expedia, you will not get the special rate.